Bacterial biofilms are extremely common in the natural environment, and biofilms are known to cause chronic inflammation that contributes to the molecular pathologies of many diseases including periodontal disease, surgical device infections, urinary catheter infections, cystic fibrosis, chronic otits media, and contact lens associated corneal infections.1 Compared to planktonic (free-floating) bacteria, coaggregated surface attached (sessile) microcolonies of bacteria in biofilms have enhanced resistance to killing by endogenous antibodies and phagocytic cells, as well as by exogenous antibiotics and antiseptics. Recent investigations indicate that many chronic skin wounds (~60%) contain bacterial biofilms, which suggests that biofilms play important roles in maintaining a chronic inflammation state that ultimately leads to the failure of skin wounds to heal. The terms critical colonisation or localised infection, which were created to describe wounds that fail to heal even with low numbers of planktonic bacteria (? 105 colony forming units, CFUs), may actually be describing wounds that have biofilms. 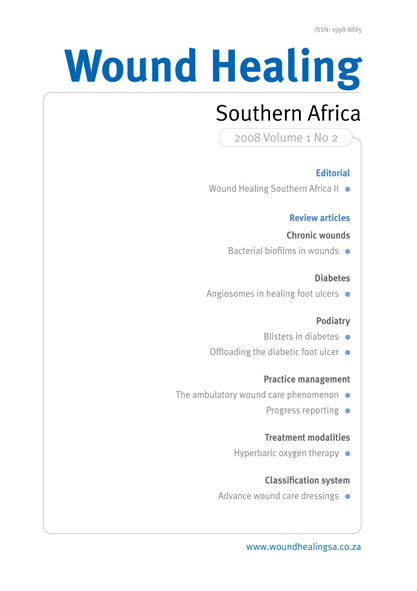 Removal of biofilms by debridement and prevention of reformation of biofilms by topical antiseptics and antimicrobial dressings may be the optimal treatment to move chronic wounds out of a chronic inflammatory phase and into a healing repair phase.